With many thanks to Sarah Steenson and Catherine Morrow of of Heritage Services at Belfast Library, Pauline Scotland of the Liverpool Record Office, the local studies department in Bradford, Sarah Powell of the West Yorkshire Archive Service and Jez Stewart, Curator at the BFI National Archive. The Titanic story has many unsolved, probably unsolvable mysteries but one perennial favourite is: what happened to the launch film of the Titanic? We know the launch films of the Olympic and Britannic were shot and exist to this day but the Titanic's is lost. Laying the keel of the Titanic (31 March 1909), Animated Weekly. - Lost. Transport of Titanic's Largest Anchor in the World (c.1911). 400ft. - Lost. Launching the Titanic (31 May 1911). Films Limited of Belfast, Included in the Animated Weekly and Gaumont newsreel. - Lost. The Titanic: at Southampton, prior to her maiden voyage (10 April 1912). Filmed by Topical Budget. - Lost"
It is not known how many of these items utilised existing material of the Olympic (like the well-known newsreel of the ship leaving Southampton, which is actually the older sister leaving New York). Thankfully, item No.5 has been found in the Huntley film archives and, as predicted by some, shows the Olympic. Ralph Currell has also noted that the Titanic appears a few times in the Kineto construction film of the Olympic. That the hold which pictures took on the general public some time ago is not on the wane was strikingly demonstrated at the above last evening when, not withstanding the weather, which invited one to stay indoors, large numbers attended and witnessed an admirable series of pictures. A feature of this week's bill is the launch of the world's largest liner, the Titanic, and those who had not the opportunity of witnessing the leviathan take the water should make a point of visiting the High Street during the week. One looks within the contents of the superb British Newspaper Archive (BNA) but their coverage of Irish papers is embryonic at present; all that could be found was in the Larne "Weekly Telegraph" of June 10th, 1911 where, under the heading of "Larne Electric Theatre", it says, "...There will be a complete change of programmes for Monday, when the "Launch of the Titanic at Belfast" will be shown..." Whereas the launch film of the Olympic was widely shown in the UK (as can be seen in the BNA), nothing could be found for her younger sister. And, even more bizarelly, there is no mention of the Olympic entering service, which was at about the same time as the Titanic's launch. One must conclude that while interest in the Titanic taking to the water for the first time elicited scant interest, there was none for the Olympic entering service. If the launch film was taken by a Belfast firm it might explain why it was only shown in that area, but the lack of footage of the Olympic is a mystery. The kind staff at the Belfast Library found a mention of "Films Limited" in Cinema News and Property Gazette from April 1912, showing that the company had a head office in Liverpool and five other branches throughout the British Isles, including one in Belfast. Looking in the Belfast street directory, there was no listing in 1908 while The 1909 - 1917 directories listed a John J Moore as an agent for Films Ltd. of Liverpool. 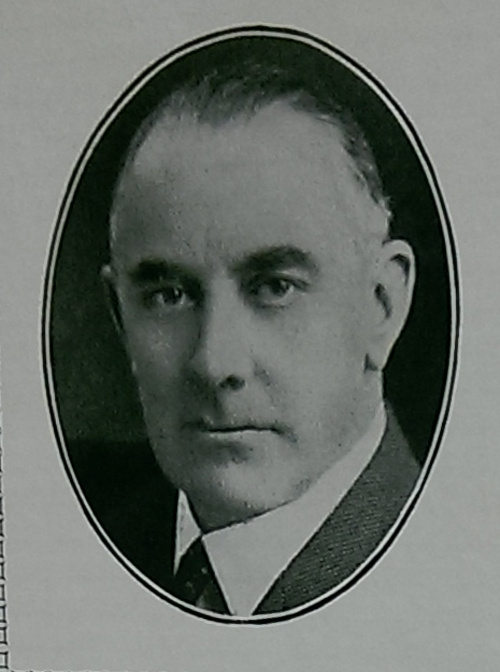 The 1918 - 1925 directories listed a John Y Moore as an agent for Films Ltd. of Bradford. There was no entry in the 1926 directory. The Belfast staff note that, "This information would indicate that the company operated in Belfast c. 1909 – 1925 and that it changed its headquarters between c.1917 – 1918. The agent may have been the same person, with the J/Y of their initial misprinted." I contacted the British Film Institute, the local studies department in Bradford, the Archive Service of West Yorkshire and the Archives of the Library of Liverpool and they had no records of "Films Limited." There are many entries for "Films Limited" in the British Newspaper Archive but these become increasingly infrequent in the late 1920s, which leads to the conclusion that they either went out of business or were absorbed by another film company. Could copies of the film have survived, or been shipped overseas? An ex-acquaintance, Steve Hall (one of many incidentally who turned their backs on my me when I needed their support, but spends a lot of his time promoting himself and his books) said that he remembered seeing launch stills on a South American website at about the time the Cameron movie came out. He remembered that it showed a launch perspective that he was otherwise unfamiliar with and seemed to be pictures from a movie taken from a launch platform, but he was never able to find the website again. He said the site was from Uruguay. I thought I knew which website my contact was speaking of (admittedly in Brazil), but sadly it is now defunct. Thanks to archive.org, I found it linked on the old seawifs "Ocean Planet: How Deep Can they Go?" page where it was listed as "a new site from Brazil." I didn't remember any launch video but it did have plenty of familiar images of the time the Titanic took to the water. Sadly, not all of the media was preserved by archive.org during its occasional snapshots. Despite initial research that Jean, the author of the page had passed away, a little bit of further investigation revealed that he was alive and his presence on social media. He confirmed that, "I'll have to search the site files but [I] have a video of the launch...At the time I found [it] on a site in the former Yahoo but would have to examine to see if it is the Titanic or is the Olympic." After weeks of looking, the Brazilian Titanic enthusiast informed me that sadly, he could not find the footage. And unfortunately, no-one in the Belfast or Uruguayan press thought this story meritted sufficient interest to publish. The only other anecdote concerning the launch film concerns Sir Frederick Rebbeck, who was chairman of Harland and Wolff for a total of 29 years. About 1957, his son was friendly with William MacQuitty who was planning to make a filmed adaptation of "A Night To Remember." Rebbeck reacted in horror and questioned the need to reopen the sore wound of the Titanic disaster. Rebbeck Sr. refused to let MacQuitty film in the shipyard or even view, let alone use the launch film that he possessed. In is unclear in this context if Rebbeck personally owned the film, or the shipyard. Where is the film now? Nothing has surfaced from Harland and Wolff. Selected items from the archives of the shipyard were sold in the mid 1990s and this would have been a prime time to sell copies of the film. The footage may have been lost, or stolen but there is another sinister possiblity. It is said that the shipyard came under attack by the IRA in the 1970s and a lot of the photographic archive was destroyed. However, ocean liner enthusiast Joseph Carvalho is said to have already obtained copies prior to the bombing and he allowed Harland and Wolff to obtain duplicates, replenishing their collection. The Belfast Telegraph of January 30th, 1973 mentioned that an explosion damaged "an office block" the previous night; the Irish News of the same day said that, "last night [a bomb] extensively damaged administrative offices...and started a fire..." The only other references to bomb attacks in that decade were attempts to destroy or damage the cranes which were in November 1972 and October 1973. Was the launch film lost in the explosion? I must point out that I have not heard of Harland and Wolff possessing any launch films at all, so the whole Rebbeck story could be apocryphal. This discussion unfortunates leads into a cul-de-sac. Some would say that, had the film existed, it would have surfaced by now, especially during the centennial events. It is a possibility that a film company facing liquidation and with no-one showing interest in their stock would simply dispose of it. And we have catastrophic bombing raids on Belfast in the Second World War. A film of the "Titanic" sitting on a shelf would have little interest shown on it prior to the 1950s when there was a resurrection of interest in the disaster. Is it possible that a copy of the film has wound up in the collection of a film enthusiast? It is possible. Lost examples of film and television have surfaced occasionally, but from my own knowledge of such people, such items of high value (assuming there is no altruistic desire on the part of the collectors) fetch huge sums privately, or are swapped for other rare items; therefore these items do not enter common circulation and their value is preserved, if not enhanced. "An expensive gloat," to quote someone. Unless new evidence emerges, I think a safe assumption is that the launch film is gone forever. But, research continues and I am awaiting further data to come in soon.